We’d been promising ourselves this trip all summer but holidays and other commitments meant that we only just managed to arrange it for the August bank holiday weekend. With a mere 23 years since my last summer visit to the area, again on the bank holiday weekend, there was a lot to do. The weather forecast was decidedly dubious by Friday so we postponed travelling up to Braemar until Saturday morning, hoping that the showers we encountered on the way were the last of the current weather system. A quick stop in Braemar for extra supplies and we arrived at the car park at the Linn of Dee to be met by a host of midges. Soon we have rationalised the rack - one rope, six slings, a set of wires, some hexes and a few quickdraws - probably still more than climbers used in the 1960s! Enough food for three days plus sleeping kit and spare clothing. With the exception of the rope and some of the food we get it all in our Mountain Marathon sacks. 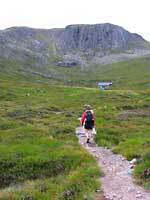 Approaching the Hutchison Bothy with Creagan Choire Etchachan behind. A nice set of signs to show us the way and before long we are at Derry Lodge getting soaked by a heavy shower. The old bulldozed track up Glen Derry has gone, replaced by a well constructed path and we make good progress in improving weather to the end of the Derry Flats. You could use a mountain bike to get this far and make the approach even shorter, the last section up to the bothy would be more trouble than it’s worth though. We pass a set of workmans’ huts (path repair) and reach the bothy in sunlight. Surprisingly, given it is Saturday, there are only two others there - they are camping but using the hut to cook and dry clothes. Even at this time of year, the days are long so I have a wander up to the crag and then to Loch Etchachan where there are several tents pitched. In the wind they will have a noisy night. Back at the hut we make our evening meal and several brews before turning in and listen to the passing showers. Neither of us have a watch with us so we have no idea of time. This is quite refreshing as we can just go where the mood takes us and let the day dictate rather than the clock. Morning brings sunshine and we decide to get the Classic Rock tick, Talisman done while the sun is on the crag. Even though the crag is “just behind” the hut, it is twenty minutes or so to get there. I decide to take the first pitch and head up the initial crack. I make an absolute pig’s ear of it! Thrashing and squirming up the wide fissure to get to a handy chockstone. With some gear I show a bit more elan but I still end up on an old stance quite a bit warmer than at the start. Steve starting the traverse of the slab - not a place for nervous seconds. Above is a vague weakness still wet from the overnight rain. Not wanting to put in too much gear to avoid rope-drag on the single rope I press on to another old stance (the current single pitch used to be three) and I place some solid gear before the traverse across the slab. This is easy but not a place for a nervous second as there are no good gear placements until the belay. This is an undercut ledge on the edge of the buttress, very exposed for such a short introductory pitch, the steep slope beneath the crag making it more so. Approaching the crux groove of Talisman. Soon he is beneath the crux and it is now spitting with rain, a couple of sorties and he is up and on the stance, now it’s my turn. The climbing up to the groove is surprisingly intricate and not what I had expected at all. Soon I am lodged in the groove attempting to make progress on the damp rock: “It’s no good Steve, I think the rope needs to be tighter than that!” Eventually I flounder onto the stance. The rain has now started in ernest and the rock is wet rather than simply damp. Surprisingly this makes it easier to climb as any friction (of which there is ample amounts even in the wet) is consistent. The top pitch is a delight with good flake holds in most of the right places and with a spectacular drop down into the gully on the right. Soon the ground eases into scrambling over boulders and I belay and bring up Steve who has managed to recover a jammed wire from the pitch. Now exposed to the full force of the wind we quickly get under way and head back to the hut, passing the couple camping there who are off walking up Ben Macdui. Walking over to the Barns of Beinn Mheadhoin. Several brews later and the weather has cleared but the crags are soaking so we decide to go for a walk and do a little Munro-bagging. Back up to the loch and head north to the curious barns of Beinn Mheadhoin. The ascent is easy with the bothy being at 700m. The barns are granite tors and the true summit is on the largest of them, it is an easy scramble though, even in the howling wind. The only way on is back the way we came but now heading into the wind and showers. Descending into the Loch A’an basin. The descent into the Loch Avon (Pron: A’an) is steeper than I had envisaged and also showing signs of significant erosion. No doubt the path builders will be here before too long. Our descent is enlivened by a rainbow beneath us. The head of Loch A’an is as impressive as ever: ringed by crags or torrents of water cascading off the plateau, it is often referred to as “The Heart of the Cairngorms” and is as wild a place as you could hope to find in the British Isles. We spend a little time slithering over the wet boulders in the coire floor, inspecting the howff of the Shelterstone (not in as bad a state of repair as I had been led to believe) before heading back up to the plateau via Hell’s Lum Crag. We altered our itinerary a little and rather than climbing out via Coire Damhain we skirted under the crag (streaming with water) and crossed the Feith Buidhe above the areas of slabby torrent, following ramps of bare pink granite and grass to the high plateau. Once again in the keen wind we headed towards Ben Macdui, the second highest mountain in Britain, the going easy over the arctic like vegetation. In the distance was a group of reindeer but other than these the only wildlife we saw were ptarmigan as they flew away from us with their “kuk, kuk, kuk” call. The clouds raised slightly as we approached the summit giving views over to the Braeriach and Carn Toul plateau still with some small snowfields left from the previous winter. With the cloud closing in again we headed down the path towards Loch Etchachan. This passes along the top of Coire Sputan Dearg - yet another crag that needs a visit. With no idea of the time but with the sun still high, we decide to extend our Munro-bagging and head out to Derry Cairngorm. The wind pushing us along the increasingly stony path. The hill is a fine viewpont as it stands isolated above Glen Derry. The blast of the wind soon sends us down and back towards the bothy, passing a lone walker putting up a tent for the night on the plateau. The following day dawns clear, so packing up our kit and remaining food and tidying up the bothy we head east back down the glen. 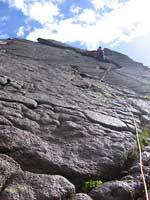 Our objective is Beinn a Bhuird (Pron: Ben a Bord) and another Classic Rock route - Squareface. Our intended path takes us across a large area of plateau known as the Moine Bhealaidh (Pron: Moin Vyallie) or Broom Moss which could be interesting given the rain of recent days. 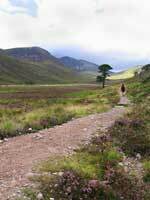 This is trackless country and our climb up is hard work enlivened only by the sight of a herd of red deer. The moine isn’t as boggy as we had feared, nevertheless we make a detour to bag another Munro - Beinn a’ Chaorainn as it is only a kilometre from our line. Somewhere around here a couple of months earlier a glider had crashed and it had taken more than 24 hours to find the plane and rescue the pilot. Despite looking however we could not see any wreckage so maybe it has been airlifted away. Eventually we pull onto the huge summit plateau of Beinn a’ Bhuird. Stood at the summit cairn it is still over a kilometre to the top of the coire we wish to climb in. Again the going is good on the wind scoured vegetation. The impressive buttress of Squareface with the remote trough of An Slochd Mor and the slopes of Ben Avon behind. With only a rough idea of where the best descent to the route lies we head to a depression on the skyline. It turns out to be a good choice as it led us to the coire lip between Mitre Ridge and Squareface buttress. Dropping out of the wind we gear up near the top of the ramp that leads down to the route. The descent is tricky and not a place to slip, fortunately for comfort we are still in our walking shoes rather than rock boots. The route begins about halfway down (or up) this ramp and the buttress still looks impressive when close up. It’s hard to believe that the line is only VDiff! Steve set off up the first pitch, dampness and a covering of grains of granite made it trickier than it should have been but soon he is on the belay on the arête. I’m now cold and following is as much a case of not bashing cold hands on the rough rock as anything. The belay is spectacular (as is the next) and this probably does as much for the route’s reputation as the quality of the climbing. Steve following the second pitch of Squareface with the ramp providing sensational exposure. I decide to run the next two pitches together but this means that I can only place a limited amount of gear as the line wanders around a lot before heading back to the arête. The climbing is straightforward and offers jugs just when you think that a VDiff could not possibly go this way. Three runners in 30m makes things interesting when a shower passes! Again the belay is spectacularly positioned but the gusting wind means that I have to take a stance on the gully side of the arête. Once Steve has arrived we survey the ground ahead. Slabby ground leads to a steepening (though still really a slab) with a choice of ways to the top: a wide crack or a layback flake. Since we have little big gear it will be the flake for us, which happens to be the original way, the crack being a little harder. Steve on the layback flake near the top of the route. Another shower rushes by to make things more interesting and Steve is away. After ten metres or so he comes to a halt and makes several attempts to gain a niche. Definitely not like Steve. Eventually he moves up and across to the base of the wide crack. Again he makes several attempts to gain the flake line a couple of metres to the right. Our largest bit of gear, a hexcentric, is repeatedly pressed into service as Steve dilly-dallies about. He makes it to the flake and announces: “I’m giving up climbing!”, “Well give up in another ten metres!” I reply. I'm now cold again from the showers and wind. More hesitating moves up the flake and thence the top provide a reason to warm up. The climbing is again easy but excellent and it is all over all too soon. We pack the gear and coil the rope and head back to the sacks. We had thought that we were alone in the coire but some voices had been carrying around and we saw t wo figures on the top of Mitre Ridge. Other than a solitary walker, these were the only two people we saw (from a distance) all day. As we headed back over the plateau, we noticed a big shower approaching and we descended to Glen Quoich being buffetted and soaked. As ever the walk back to the car seemed to take forever, but eventually we could get some dry clothes on and head into Braemar for something to eat. The following day was so windy that we just went walking up Lochnagar. The wind was so strong it was blowing grit into our faces and a pebble the size of a golf ball when thrown into the air would be blown along. The long drive south was enlivened by the water pump on Steve’s car packing up so we got a lift home from a very nice man in a rescue vehicle.